The countermeasure to take depends on the detailed description under the Link Failed message. The date and time set for the unit is prior to the term that validates certification. In this case, confirm the date and time set for the unit, and correct the setting. Certification is valid between 2015/8/17 and 2016/8/27 (as of 2015/8/17). The expiry is updated every year. Date and time are reset to 2015/5/1 (for V2.1) if the unit is not used for approximately two weeks because there is no long-term backup clock function for CBK-WA100/101. If user authentication is attempted after date and time are reset, the Link Failed message occurs. The date and time default will be changed to the latest date and time with the V2.2 release. The date and time set for the unit is later than the term that validates certification. Either the username or password is entered incorrectly. In this case, enter the correct username and password. 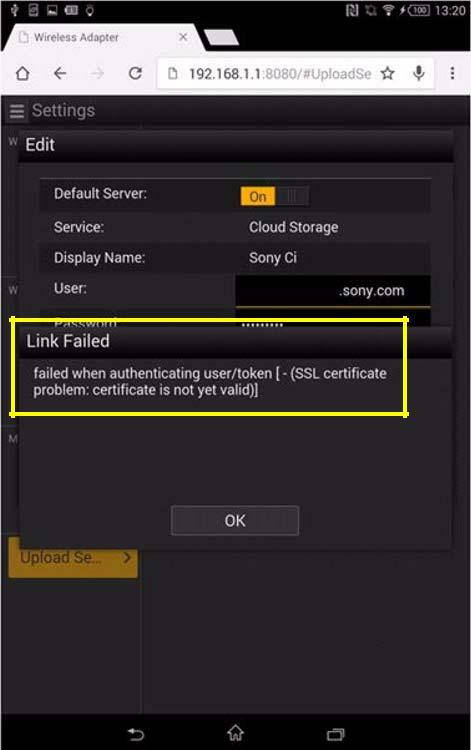 The host name for capture.cimediacloud.com cannot be resolved. In this case, confirm that unit is connected to the internet, or confirm that the DNS server setting for the network being used is correct, and set the correct value.